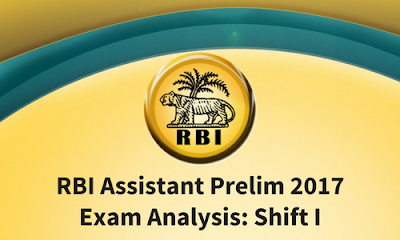 The first shift of RBI Assistant Prelims Exam 2017, which is ongoing today, is over. The exam's difficulty varied between moderate to difficult questions. There are total 4 shifts of the exams and 1st shift is over. Here is the exam analysis which will be beneficial for the candidates going to appear in upcoming shifts. This section has 4 puzzles that consumed a lot of time. This section has easy to moderate question. Students did not find any difficulty in this section. English section was easy to moderate.